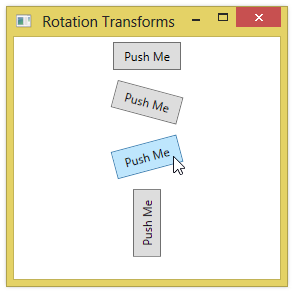 You can use a rotation transform to rotate a user interface element. To rotate an element, you specify the number of degrees to rotate, in a clockwise fashion. A negative number will rotate the object counter-clockwise. By default, the object is rotated around a point at its center. You specify rotation using a RotateTransform element, setting values for the Angle property. Note that rotating an element normally doesn’t change the element’s ability to respond to user input.